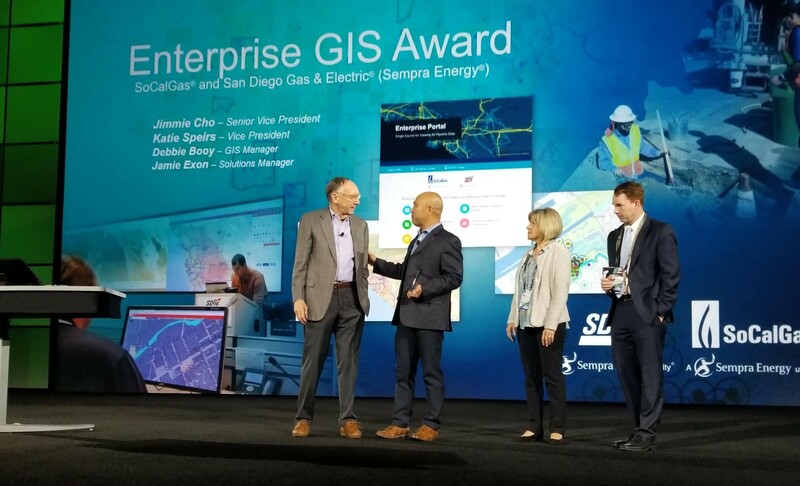 SDG&E and SoCalGas Honored with Enterprise GIS Award at the 2018 Esri International Conference. Osceola Consulting congratulates Sempra Energy Utilities (SEu) San Diego Gas & Electric (SDG&E), and Southern California Gas Co. (SoCalGas) on winning the prestigious Enterprise GIS Award. The Award is given annually by global GIS Technology leader ESRI to only one corporation worldwide across all industries. The award recognizes a company that uses geographic information system software to provide meaningful business intelligence across the organization – from staff to field operations to management. It recognizes both utilities as international industry leaders for their pioneering uses of Geographic Information System mapping technology to deliver energy safely and reliably. Osceola Consulting is proud and honored to have the opportunity to support SEu’s extensive enterprise-wide mapping and GIS services group over the past five years. Osceola provides onsite GIS project management, solution architecture, and other GIS technical services as well as offsite GIS Testing and Mapping Services at the Technology Delivery Center on the Morongo Reservation in Riverside County. Pictured (L-R): Jack Dangermond, Esri founder and president; Jimmy Cho, senior vice president of customer services for SoCalGas, and senior vice president of distribution operations for SoCalGas and SDG&E; Debbie Booy, GIS Manager; and Jamie Exon, Solutions Manager.